Summer nights in L.A. just aren’t the same without a bright orange moon. I see that sad, wan little thing overhead now and I remember when I was a kid and looking up, wheezing, and seeing the prettiest orange moon you ever saw. Suns were gorgeous, too, though spookier, a deep orange, almost crimson….your eyes would sting and tear up and you’d think wow, what a groovy orange…maybe that’s not such a good thing. A goldfish upside down in the bowl bloatin’, the Captain said, nailing it. There were no mountains during a Stage 3 Smog Alert, and sometimes not even hills. Just thick brown air. Come dusk the whole sky to the west was on fire and the sun, huge, slipped into the sea. Darkness descended and with it that orange moon again, hanging there, lovely. We drank Bud talls and passed ragweed reefer and it hurt drawing it in and the moon became even more vivid, more orange, more beautiful. Someone called her a goddess once. We’d gaze up and pray to her for a santa ana. Please, oh Moon Goddess, deliver us. Sometimes it worked, bringing gusts of desert air that would scour the city clean. Mountains magically appeared. Blue sky. We’d go up to Mulholland Drive and the city spread as far as the eye could see, and there was Catalina, there were the Simi Hills, there was distant Orange County. But sometimes the desert winds brought fire. Sirens and a pall of smoke. Cinders would rain down silently, you could hold out your hand and a tiny little carbonized flake of a house would settle in your palm and then vanish. The very air smelled charred, your clothes, your furniture, your hair (we had lots of hair then) all stank of smoke, and the moon on those nights was an angry goddess, crimson, warning of death and destruction and the end of the world. Distant sirens would send us to the television where every channel was breathlessly reporting the progress of the flames. Sometimes you could see them yourself, brilliant red lines that stitched along the side of the mountains. We’d watch with smarting eyes. The whole world stank of smoke. Come dawn, the sun appeared over the mountains again, angry orange, menacing, not good. Sunsets were gorgeous. The moon hung orange and perfect again. We’d drink our Budweiser by her light. As we cruised the freeways those summer nights, windows down, music blaring, shouting over the din, she raced along with us, a guardian angel. We’d stop. She’d stop. We’d go, she’d follow. The orange moon watched over us, beautiful and eerie. She wasn’t really orange, someone said, that’s the smog. No, someone else said, inhaling deeply, she’s a goddess. He coughed and the car filled with cheap weed smoke that blew out of the windows and into the poison air. I wonder about our lungs, sometimes. 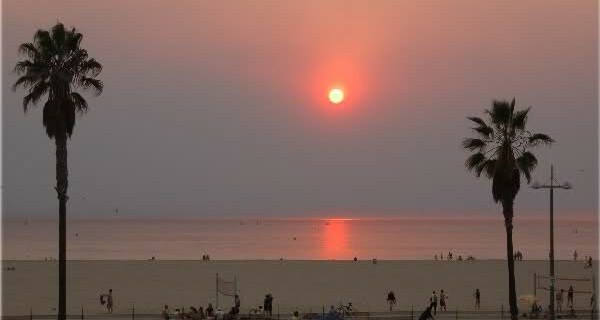 Here’s a orange sun over an L.A. Beach. I couldn’t find an orange moon. Maybe the film corroded or the lenses melted or the photographers asphyxiated. This entry was posted in Autobiography,memoirs and confessions, Greater L. A. hipsterpolitan region, Places, Story telling and tagged air pollution, Bills Corpse, brush fires, Budweiser, Captain Beefheart, Don Van Vliet, fire season, goddess, lungs, moon, Mulholland Drive, orange moon, orange sun, santa anas, Simi Hills, smog, smog alert, Stage 3 Smog Alert, sun, sunset. Bookmark the permalink.